Nestled on 1.42 lush acres in a private pastoral setting, 665 Dodds sits on an exclusive Gladwyne lane and feels removed from it all, yet is close to conveniences including the town of Gladwyne, Suburban Square, Villanova University, and train lines for easy commuting to Center City and beyond. As you proceed through the pillars and meander down the long private drive, you're enveloped by a sense of peace and tranquility. Coming into view is the classic French-style property surrounded by meticulously-maintained grounds, with a fabulous swimming pool, pool house and stone patios affording resort-style pleasure. The understated exterior gives way to a stunning, sprawling residence, introduced by a wide wainscoted entry foyer. The high ceilings and open-concept layout flow into the elegant living room through an arched opening. The sunken living space is drenched with natural light filtering in through the wall of windows and features an architecturally-distinctive fireplace, cove shelving and gleaming hardwood floors. Glass French doors spill out to the smaller patio, making it the perfect place for quiet relaxation, reading or a more intimate social gathering. The dining room is divine, bright and airy, leading to the window-surrounded sunroom with a slate floor offering gorgeous views and all-season enjoyment. Openings on both sides of the sunroom to both the larger and smaller patios make for seamless indoor-outdoor entertaining! The entire back of the property overlooks the picturesque gardens and rear yard where the young ones and pets will have a ball! Adorning the charming family room/den is wood paneling, a wall of built-in bookshelves and a wet bar, perfect for casual gatherings. The kitchen is every cook's fantasy with top-of-the-line appliances, slate radiant heat flooring, generous granite countertops and a large island with seating, as should be expected with a home that appeals to today's discerning buyer. The lovely 1st-floor master suite is a tranquil oasis with a huge custom-fitted walk-in closet, spa bath with double sinks, a Whirlpool tub, large shower, and laundry hookup. A 2nd bedroom with an en-suite bath currently serves as the master sitting room. Three 2nd-floor bedrooms are all spacious and stylish, complemented by 2 full baths, 3 sizable closets and attic storage. 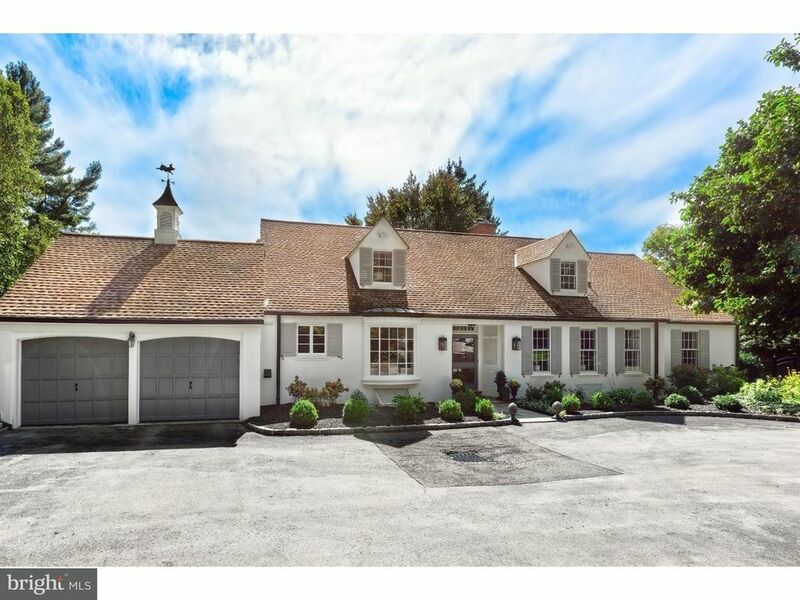 An attached 2-car garage, unfinished walk-out basement with additional laundry and a propane-powered generator add to the allure of this very enchanting luxury home.